This past week I've been working on the 16 blocks for the Night and 16 blocks for the Day quilts, pattern courtesy of Jinny Beyer. This first picture is the Night quilt, darker in design, and will finish at 43" x 43". The second picture is the Day quilt. Or I can combine the 16 blocks from each quilt into one larger quilt that will finish at 65" x 65". I think borders will help unify and finish whatever I decide to do. For the next few days I think I'll keep this quilt on the studio floor and study and rearrange and ponder before making any final decisions. I have a computer notebook carrier/bag which is ready to be put together and I can always go back to my free motion quilting practice. Definitely there are things to do to keep me busy! We're heading to Stevens Point, Wisconsin, for the weekend. It's the Moscinski family reunion. John's grandfather was one of five brothers who immigrated to the US in the 1890's. Four of those brothers settled in central Wisconsin, and John's grandfather opened a bakery in Chicago. All of our kids and grandkids are going - so is John's sister. It'll be interesting and fun. We're driving home via Minneapolis and visiting with former neighbor Michelle Mushel whose 15-month old Camille we've yet to meet. I've made Michelle and her husband Ryan Mors bags, and baby Camille gets her own bag. Why didn't I make bags for the Moscinski's? There will be over 200 of them! I have already confessed an on-going love affair with all things Jinny Beyer. Her designs and sense of color create beauty. While I have ordered fabric from her studio, I am also trying to develop my own sense of color, especially in a graduated palette. She has made her pattern "Night and Day" available as a free download, for which I am thankful. In the previous blog entry I worked hard at choosing 14 fabrics. After an intense weekend of preparing the 12 strip sheets of 7 fabrics each, today I did the cutting and some preliminary layouts, auditioning different backgrounds. Can you tell that I'm actually making decisions about background for two quilts? For the Day Quilt the predominant pieces go from light to dark. It's just the opposite for the Night Quilt. Jinny Beyer intended the Day quilt to have a light background, but that's just too light for me. On the other hand, laying on the Night pieces on a green mottled background doesn't do it for me either. 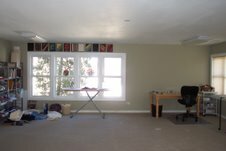 Everything is on my studio floor, and I'll leave all four possibilities there until I make a decision - or get tired or walking around them. 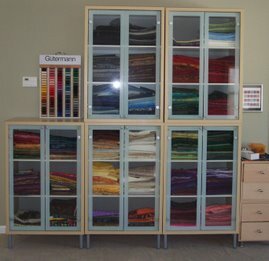 Despite my vast stash, I may even have to make a trip to quiltfabric.com in Willowbrook and look for different backgrounds. I do like the fabric decisions I made to create the strip sheets, and being thoughtful about the background for each quilt is a good thing. Blogging at this point really is useful - I'm able to study these pictures and decide which background appeals to me the most. Seeing things on the design wall - er, floor - is one thing. But then seeing the photo image sometimes makes things even clearer. After doing so many Mors bags in a row when several times a day I can look at a completed project, it's hard to switch over to projects that take more than 45 minutes. But I've got two going right now, and they are quite different from one another. For the past several weeks I have been wavering and dithering about whether to make a new Jinny Beyer project. Today I finally started Night and Day, thanks especially to some prodding from a faithful blog reader/writer Josie Ray. Josie lives near the Jinny Beyer Studio in Virginia and visited the studio. And she asked me these important question? How could I not make one of Jinny Beyer's projects? How could I not surround myself with the glory of one of her color palattes and design? Jinny Beyer is wonderfully generous about making her patterns/directions available. So the palette of my fabrics is together, and I started cutting the strips this morning. There's a lot of detail work but the payoff is a big one - 2 quilts at the same time. The other project I'm working on is quilting a piece of whole cloth that I bought in Rajastan, India, last year. For once piecing is not the goal. Instead it's all about the quilting. Quilter Friend Wayne has taught me some of the fundamentals of free motion quilting, but I'm still not comfortable enough with the process to actually use it for quilting. 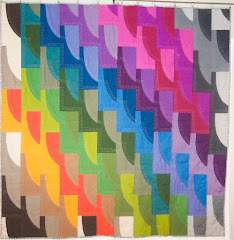 But I've discovered a new blog - 365 Days of Free Motion Quilting Designs. In fact, I love this blog so much I've even paid to support it. This whole cloth is so busy that it's the perfect piece to practice the various free motion techniques. You can see some of the detail - this is indeed a work in process and will be for a while. But if I can work 30 - 45 minutes a day on this quilt, I think I'll improve! Finally, I have created a second blog. One of my dilemmas is that I have a growing stock of quilts. 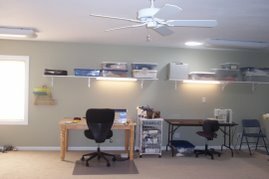 And a satisfying solution, thanks to Wayne, is the creation of a second blog, just to showcase quilts that are for sale. It's still a work in progress. We're going to Cecilia and Bob's for a 5th of July dinner, and I offered to bring something. Cee declined the offer. But I think she was talking about food items. She didn't say not to bring a Mors bag or two. These two coordinated bags are both from fabrics I've had for a couple of years and have yet to put into a quilt. These bags are serving as a Happy 33rd Anniversary to them (I'm so bad about sending cards) as well as a host/hostess present. And quite frankly, if she chooses to regift these bags, that is fine with me as well. It's all about "Reduce, reuse, recycle," isn't it? For over 15 years John and I have been patients at Family Medical Center of LaGrange, started by Dr. Steve Sauerberg. With him in practice are Dr. Daniel Chen, Dr. Scott Robertson, Dr. Judith Lin, Dr. Michael Dupont, and PA-C Debbie Sleeper. I have been seeing Debbie for five years but have also seen and talked to Dr. Dupont. And John likes his relationship with Dr. Chen. I'm crazy about everyone in this office. The referral staff, the reception staff, and the nurses are all terrific. I was thankful for the referral to my orthopedic surgeon Dr. Groya. When I had a blood clot in December, I was admitted into LaGrange Hospital within 45 minutes once Debbie knew. After 6 months of being on a blood thinner, I think each one of the doctors has at one point weighed in on my Warfarin dosage. I walk into this office smiling, and I leave this office smiling. My parents are starting with Family Medical Center of LaGrange next week. The general practioners they are currently seeing do not inspire confidence. I'm happy they are willing to make the change. My mom is going to see Debbie, and my dad will see Dr. Dupont. There are 19 worker bees and 6 doctors. I've already given Debbie some bags - and I think Debbie knows I would make her whatever she wants. So here are 24 Mors bags for everyone else on staff. I'm constantly appreciative of the quality of medical care that my husband and I - and now my parents - receive. In appreciation also of the earth's resources, these shopping bags come with the mantra "Reduce, Reuse, and Recycle." And for what it's worth, my fabric stash is now finally looking managable! I couldn't help it. When the price of the Kindle dropped, I bought. So far I'm halfway through my first book and really like it. For travel it will be perfect. But how to pack it? I experimented with a quilted carrier, one that would hold the cord separate from the Kindle. This is like an envelope with 2 compartments. The one for the Kindle is shorter, and the one for the cord is deeper so that the two don't overlap on one another. John thinks it needs a shoulder strap, but I'm not so sure.